There appears to be much apocalyptic talk in Edinburgh this year. I’m in London, so I’m reliant on The Guardian copiously recording all the key events. Ewan Morrison discusses a “bleak vision of a publishing industry in terminal decline“, which won’t help to cheer up a wet, end-of-summer Tuesday afternoon – but if you haven’t read these arguments, you should now. Are books dead? Can authors survive? I think publishers are in far more trouble than they imagine. The change is not going to happen in a generation, we’re talking months. The biggest Christmas gift last year was the Kindle. The average person is a little slow, but they catch on. Once they figure out how they can get any book they want for free, they’ll never pay for another one. Out of curiosity (not really criminality), a few months back I downloaded a few book bundles from Pirate Bay. I now have in my possession something like 30,000 books. You can get anything. People assemble the entire New York Times best seller list and you can download it in a few minutes. What we’re about to see is the catastrophic collapse of the publishing industry. We’re literally talking a few financial quarters away from all our bookshops being shuttered up. We’ll be left with soulless mobile phone shops. Good books, music, film, are essential to the quality of our lives. Without them, or with poor substitutes, our lives are a lot poorer. 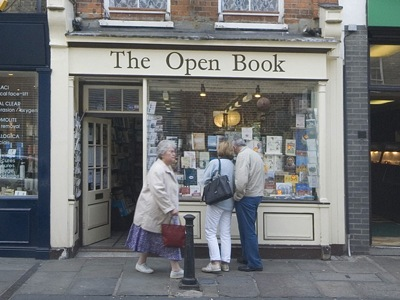 I spent a delightful thirty minutes in Richmond-upon-Thames’s excellent Open Book shop this afternoon. A small, corridor-shaped space packed to the rafters with interesting books, new and old. I don’t doubt that Richmond will be able to sustain The Open Book for a while yet, perhaps for longer than it can Waterstone’s, but as I riffled through book after delightful book, I did wonder if we really knew what we were doing, laying waste to all these welcoming places, full of such good, valuable and important things.